Working with Graham & Brown’s existing app. Apposing were asked to assist with improving user experience, by adding new elements and functionality, as well as being asked to help the brand drive downloads. Hosting an ideas and innovation lab, we understood more about the requirements of the Graham & Brown app. We discussed ideas and presented new concepts and design changes that would help to drive increased downloads of the app and prolong time spent in app. 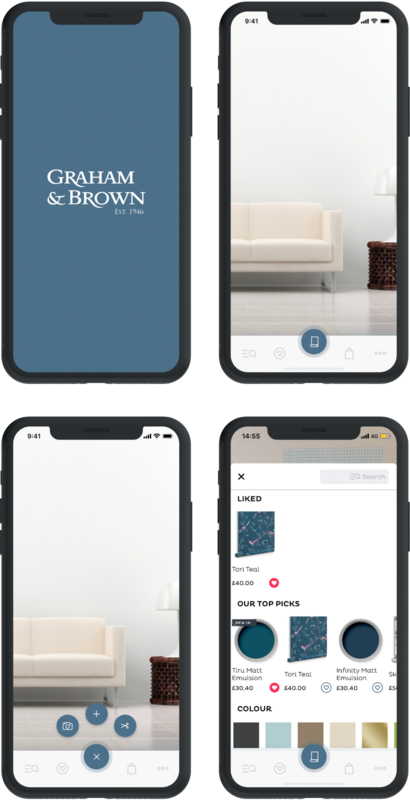 We worked with Graham & Brown to deliver a range of user experience improvements including layout examples and improved iconography throughout in order to enhance the users in app experience. In addition to design enhancements and new functionality, we also developed app store optimisation as well as introducing Graham & Brown to Apple at a meeting hosted in Apple’s London Headquarters.